Cook with Pumpkins + Free Printable! It’s all about the GUTS to boys when it comes to carving a pumpkin! I think one of my favorite things to do at this time of year is to carve a pumpkin. We’ve never done any scary carvings, we usually do fun creative art carvings. No matter what the carvings have been, my sons always loved digging out the guts and slopping them around while picking out the seeds for yummy roasted pumpkin seeds! It’s a super easy recipe that boys can cook! I’m so honored be sharing with you some of my old homeschool fun with this learning printable about pumpkins along with a super simple recipe that I know your boys will enjoy too! I sort of have this thing about making everything fun . . . especially when it comes to learning. I guess that’s because I think learning IS fun! I can think of a million things to do with a pumpkin, but for the sake of not being overwhelming, I’ve shared some very basic learning skills that boys would enjoy while slopping around in the guts of the pumpkin. I know, I know . . . messy, but FUN! Having kids estimate is a great math skill AND it’s great for cooking! How many recipes do we make without measuring exact amounts? We estimate . . . right?! Have your boys estimate how many seeds might be in the pumpkin. Use the pumpkin seeds to count by 2’s, 5’s, and 10’s. How many 10’s add up to one hundred? Make piles of ten. Make a pile of how many seeds were estimated. See how many more seeds there are than expected…or not! 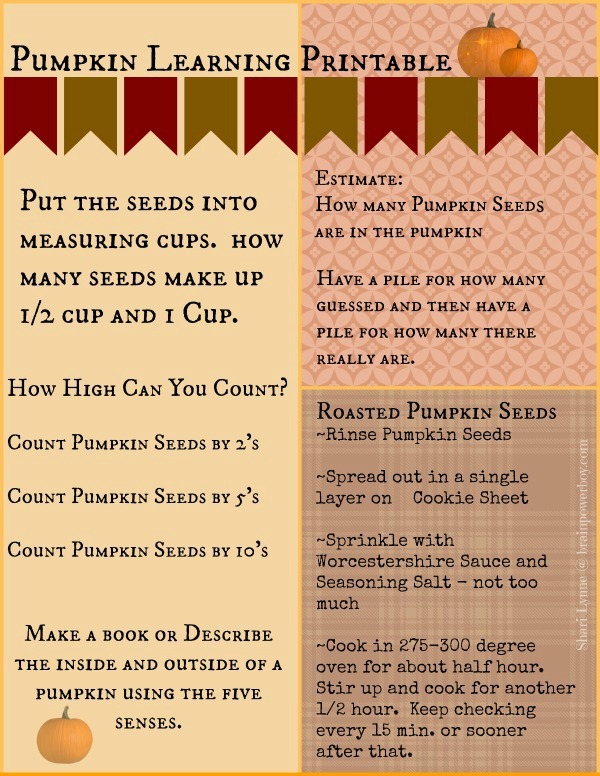 See how many seeds it takes to make a 1/2 cup. How many to make 1 cup. You can create a book or just describe the inside and outside of a pumpkin using the five senses. Some boys like to make books, some don’t. Then make the very simple recipe above. It’s deelish! Boys can cook! Oh Ya! What is your favorite way to learn with pumpkins? Do you have an easy pumpkin recipe to share? Please leave a comment–we would love to hear from you. Great Games to Play–Warning, You Might Learn Some Math! Hi There! My name is Shari Lynne and I'm a Mom to 7 and Grammy to 6. I LOVE to create recipes that are easy, economical, family friendly (kids) and deelish! I believe that God is in the everyday, including the kitchen!